Welcome to the Brookdale Amateur Television Repeater System Home Page! The Brookdale Amateur Television Repeater System is owned and operated by the Brookdale Amateur Radio Club at Brookdale Community College in Lincroft, (Monmouth County) New Jersey. 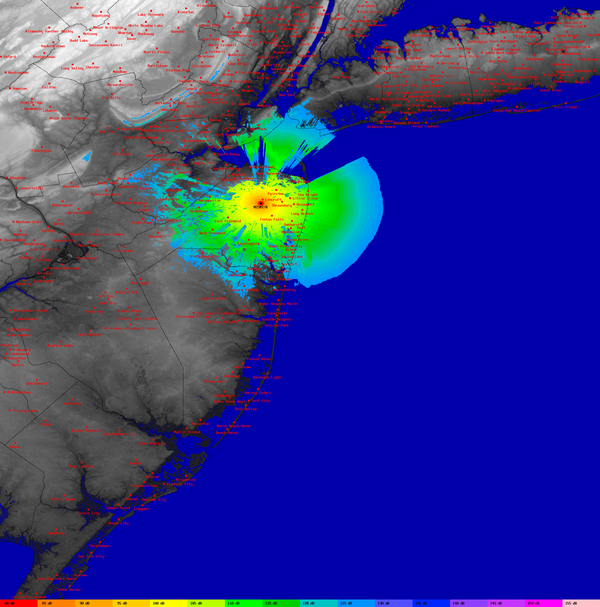 Conceived in 1991, the repeater has been operational since June 14, 1995, and serves the North Jersey Exterior Area on an input frequency of 426.250 MHz, and an output frequency of 439.250 MHz. The repeater uses a horizontally polarized antenna located 350 feet above ground level, and shares tower facilities with radio station WBJB-FM. Provide hands-on exposure of a working multimedia telecommunications system to students enrolled in engineering and technology courses at Brookdale Community College. Join the Batwing Antenna Design Challenge! These projects will be undertaken as time and finances permit. The repeater may be temporarily unavailable while upgrades and system maintanence take place. Watch this space for the latest news and information. In order to maximize the repeater's service area to the greatest extent possible, the Brookdale ATV Repeater operates from an antenna located 350 feet above ground level, and provides reliable service to many areas of Monmouth County in New Jersey as well as areas of Brookyln and Staten Island in New York. Because of the correlation between standard CATV frequencies used by cable television systems and amateur radio operators involved in ATV communications, television receivers and VCRs with "cable-ready" tuners as well as some cable converters that cover "hyper-band" channels may be used to receive ATV signals directly without the need for an ATV downconverter. For example, the Brookdale ATV Repeater transmits on 439.250 MHz, and may be received on CATV channel 60. A low-noise GaAsFET preamplifier is required for reception comparable to that of a good downconverter. A horizontally polarized antenna tuned to 439.250 MHz and aimed toward the repeater is required in either case. In addition to providing subcarrier audio for reception on standard television receivers, the Brookdale ATV Repeater also frequency modulates its video carrier with audio using a deviation of 5 kHz to permit simple, low-cost reception with portable UHF-FM transceivers and scanners tuned to 439.250 MHz. When the system is not in use, the repeater transmits a video identification graphic every 10 minutes on 439.250 MHz to aid those setting up their home ATV stations. A morse code identification (N2SMT/R ATV) can also be heard during these periods. Pocket-sized television receivers (Casio, Watchman, etc.) have also been known to receive 70-cm ATV signals directly with no modification simply by tuning below UHF channel 14 (470 MHz) in strong signal areas. The Brookdale ATV Repeater System serves as a shining example of how a 70-cm in-band ATV repeater system can be made to peacefully co-exist in an area dominated by an abundance of 440 MHz FM repeater and packet radio systems. Click on the above graphic for further details on the legal issues and the interference considerations made in the selection of a 426.250 MHz input / 439.250 MHz output ATV repeater split. This frequency pair is quickly becoming the new standard for 70-cm in-band ATV repeater operation on the east coast of the US! "afford amateur radio licensees a unique opportunity to become better informed about space communications and to feel a sense of participation in the United States space program. Further, re-transmission of the Space Shuttle communications gives amateur radio operators experience in setting up ad hoc links and networks around the country in order to carry the Shuttle information to interested amateurs. This experience would be invaluable in the event of a natural disaster or emergency in which similar communications links were required." In recent years, many NASA astronauts have trained to become amateur radio operators, and have operated amateur radio stations from the Russian space station Mir, the U.S. Space Shuttles, and the International Space Station. NASA-TV coverage provided by the Brookdale ATV Repeater System has been invaluable to earth-based amateur radio operators wishing to communicate with astronaut/hams living and working in space. NASA-TV transmissions are normally carried by the Brookdale ATV Repeater System between the hours of 9:00 AM and 9:00 PM local time when the Space Shuttle is in orbit. Being a platform for experimentation, research, and development that is supported by higher education and local industry, all engineering results obtained through the design, development, and operation of the Brookdale ATV Repeater System are published openly in an effort to promote learning, technical discussion, and to contribute to the advancement of the radio art. Curious as to why repeater systems have time-out timers? Do they exist to discourage "repeater hogs", or are they simply a legal requirement? Are there any differences between the regulations regarding ATV and FM voice repeaters? Check out the July 1998 issue of CQ VHF magazine for an unbiased and informative discussion of repeaters and repeater timers by Rich Moseson, W2VU that was inspired by none other than the operation of the Brookdale ATV Repeater System. 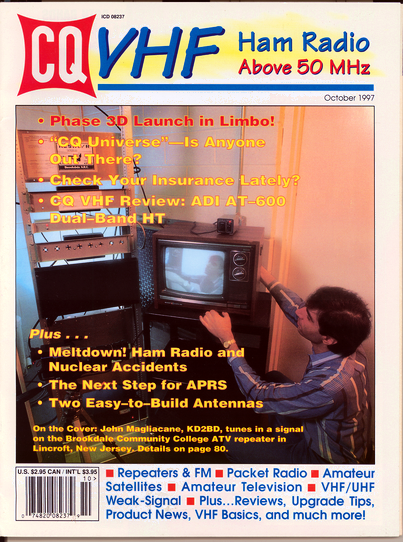 The Brookdale ATV Repeater System received world-wide recognition when it was featured on the front cover of the October 1997 issue of CQ VHF magazine. Click on image for more views of the repeater system. Brookdale Community College is a non-profit organization. Donations to this project are greatly appreciated and may be tax deductible for some donors. Please send e-mail (kd2bd AT amsat DOT org) if you have any questions or feel you can contribute to this educational and public service oriented project. This page is the recipient of several awards for design and content. It was last revised on February 24, 2014, and is updated as time permits. Thank you for your interest and support of the Brookdale Amateur Television Repeater System!